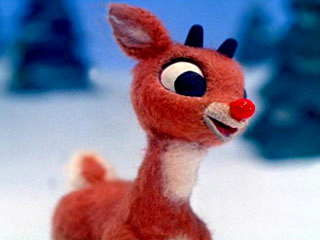 Yes, the red-nosed reindeer. It’s the most wonderful time of the year, and we’ve been enjoying all the old Christmas classics my husband and I grew up with. We especially like the original Rudolph, the story of the misfit reindeer who befriends a misfit elf and a bunch of misfit toys and ends up saving Christmas for everyone. It is a beloved classic, but especially so because it fits our special needs life so well. The story of Rudolph is one we live daily as parents of special needs children (or as people with special needs). It is not our child’s fault that he or she is different – it’s not like anyone would want to be blind or disabled or not feel pain or have a shiny red nose. And yet, the other reindeer won’t let our children join in any reindeer games (like Monopoly!). Sometimes, instead of prejudicial reindeer, it’s the other parents who give dirty looks to our disabled children, or the schools that will not honor IEPs, or the discriminatory Santas that won’t let special needs kids on their laps, or the million other injustices that happen every day in this special needs life. Rudolph’s story gives us hope. His disability turned out to be the very reason he was able to save Christmas. He did not discriminate against Herbie or the misfit toys. In fact, he helped them overcome their own limitations and reach their full potential. It turns out that we, as parents, have a little Rudolph in us too. We are guiding our children through life, helping them overcome obstacles, fiercely advocating for them, being their first and best champions. And someday, just maybe, our children might go down in history, too (like Washington! ), by using their limitations as strengths and giving us a new perspective. I know Gracie will. She is going to change the world with her shiny red light of love. A beautifully written post. Thank you so much for sharing your blog with me. Just stopping by to say Happy New Year! !